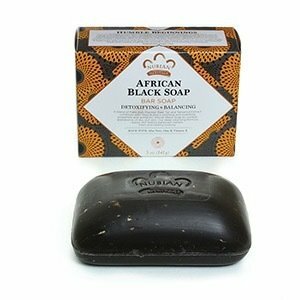 This all natural African black soap has will cleanse and nourish your skin because it is infused with shea butter.Black soap purifies while shea butter moisturizes, healing worn-out skin and making it touchably soft and smooth! Added vitamin E promotes skin elasticity while nutrients from oats help to reverse the aging process. Aloe comforts tired skin, leaving you refreshed and energized. The benefits are endless! Open the door to younger and healthier skin today! 5 oz.